The Trinity community is located in Pasco County, Florida and named after Trinity College of Florida, a Bible college founded in 1932. Trinity is a fast-growing upscale community currently consisting of mostly moderate to higher priced single family homes and luxury apartment complexes. Swimming and gathering with family and friends around the pool are a part of the culture of our community. If you're looking for a Trinity pool builder to transform your back yard into the perfect Trinity outdoor living space for you and your family, look no further than Grand Vista Pools. We've been building new swimming pools in Trinity, Florida for two decades. One of the things that makes Grand Vista Pools special is not only are we an experienced pool builder, but we are also a licensed general contractor. This means we can design and build your entire outdoor living space including any renovations to your home which may help your indoor living space better flow with your outdoor living space. Do you have an older swimming pool that needs remodeling? Want to add a spa? Lighting, water or fire features? We can do everything from basic pool resurfacing to an extreme makeover. 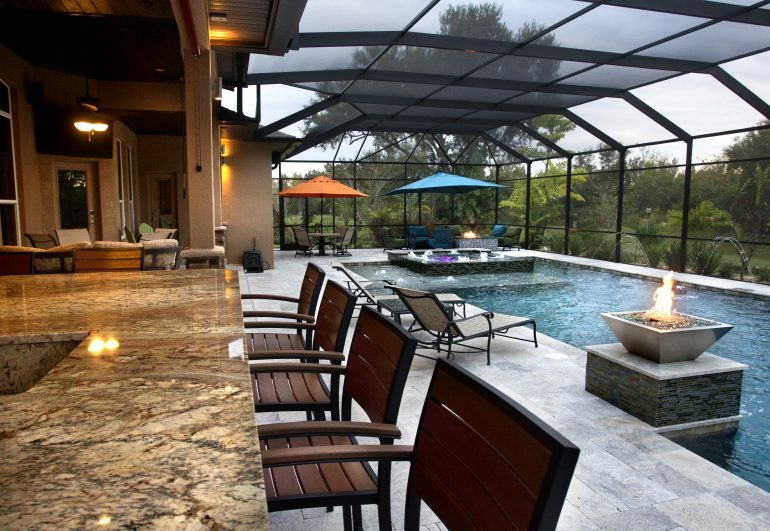 Grand Vista Pools also specializes in designing and building Trinity outdoor kitchens. From a stunning outdoor grill to a full-featured kitchen to a relaxing outdoor bar, we can create the perfect outdoor living space for you.